San Francisco/Fisherman's Wharf is a star article! It is a high-quality article complete with maps, photos, and great information. Fisherman's Wharf is San Francisco's most popular destination among travelers, with around 12 million visitors flocking here each year. For over a century its historic waterfront was the hub of the city's fishing fleet and is still famous for the depth and variety of its harvest, as well as for having some of the best seafood restaurants in the city. Today, it's also renowned for its numerous tourist attractions such as museums, souvenir stores, historical buildings and piers, and scenic vistas over the Bay. 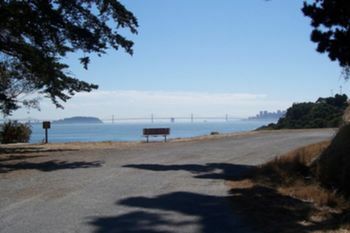 It is located at the northern tip of the San Francisco Peninsula, along the San Francisco Bay. It runs all the way from Pier 39 through to Municipal Pier at the end of Aquatic Park. It is bordered by Van Ness Ave to the east and Bay St to the south. Three generations of fishermen have worked on the Wharf since the 19th century and the days of the Gold Rush. Once boasting an impressive flotilla of nearly 500 fishing vessels, the fleet’s numbers have dwindled over time. 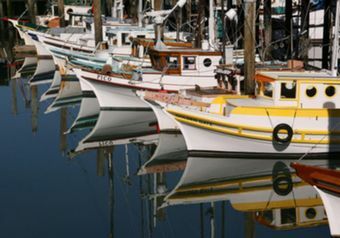 Today, the boats moored at the Wharf are only equipped to supply San Francisco's restaurants with a small portion of their seafood appetites. 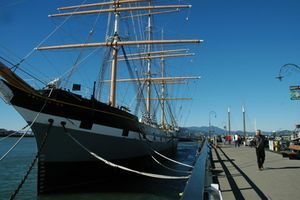 Most of the remaining vessels are moored at Fish Alley, close to Pier 47. 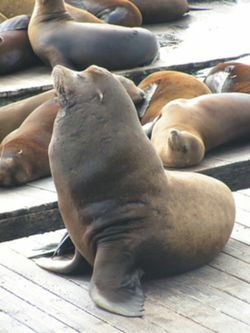 Every year the Wharf attracts millions of visitors to its numerous and eclectic attractions including; the sea lions at Pier 39, the Maritime Museum, the chocolate factory at Ghirardelli Square, Hyde St Pier, and of course the infamous Alcatraz. There are also some great vistas overlooking the Bay, and a plethora of restaurants to enjoy them from. Additionally, many people visit the Wharf to either take a ferry or a cruise around the Bay. 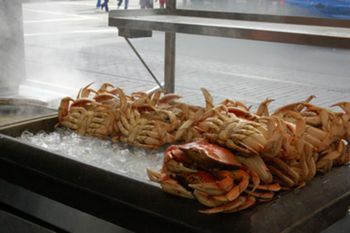 The Wharf is also home to many events such as the Fourth of July celebrations, Crab Season, and Fleet Week. Being a tourist haven, expect to see large crowds, an abundance of t-shirt stores, novelty museums, and street performers all vying for your attention. Many locals are put off by the crowds on the Wharf, and the seemingly "tacky" nature of many of the tourist stores and attractions. However, all things considered, there is probably enough here to keep everyone happy. Getting here on foot or via public transportation are certainly the best options if you are already in or near San Francisco. Driving here is easiest (but often slow) by going north on Van Ness Ave (which is part of U.S. Highway 101) up to North Point St (a block beyond Bay), turning right, and then locating a parking space after a few blocks. There are a number of smallish lots, and two major garages near Pier 39, at Stockton and Beach. If you plan to spend much time, you may want to park on a street farther away (but watch the posted limits) and take public transportation to the Wharf. If you are so inclined and have good brakes, you can go from Van Ness Ave onto Lombard St east, up Russian Hill and down the "crookedest street" in San Francisco. Turn north on any of the streets (except Taylor, because of the cable cars) into Fisherman's Wharf. Stockton St, 2.5 blocks past Columbus Ave, gets you to the garages. Note that pedestrians and cable cars have the right of way. From the Bay Bridge it is best to get off soon, head north and east towards the Embarcadero, and then go west into the Fisherman's Wharf area. You'll see the garages across the way near Pier 39. San Francisco is small, so consider taking a taxi, at a cost of around $10 from downtown, and double the price from outlying areas. The Powell/Mason cable car  line brings you a few blocks south of the center of the district, at Taylor and Bay Sts. 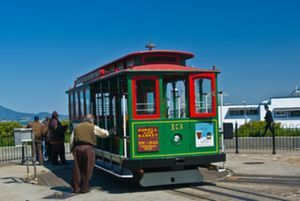 The Powell/Hyde cable car  line brings you to Fisherman's Wharf western end, at the intersection of Hyde and Beach Sts. Both cable car lines start at Market and Powell, near the BART and Muni station there, pass Union Square, and traverse the charming hills and houses of San Francisco before reaching Fisherman's Wharf. The historic F streetcar line comes up on Market from Castro Street, turns west at the Embarcadero in front of the Ferry Building, and traverses much of Fisherman's Wharf. You can exit at any of the Market St BART or MUNI Metro stations to catch the streetcar to Fisherman's Wharf. MUNI  offers several bus routes to Fisherman's Wharf. The frequent 30 Stockton trolley bus and the 47 Van Ness bus go from the Caltrain station to Fisherman's Wharf, using very different routes. The 30 bus goes through downtown, passes Chinatown and North Beach, and then west via North Point St up to Van Ness. The 47 bus takes longer; it goes first through the grubby parts of the SoMa area, then via the Civic Center up Van Ness, and finally east on North Point St. Additionally, the 8X Bayshore Express and 19 Polk also serve the area. The 39 Coit heads up to Coit Tower in North Beach. Due to its proximity to the Downtown area, one of the best ways to get to the Wharf is simply to walk! Eastbound through Fort Mason from the Marina (15 mins), northbound along Columbus Ave from North Beach and Chinatown (25 mins), or from either the the Ferry Building or the Financial District, walk northbound along the Embarcadero promenades (25 mins). Fisherman's Wharf is best seen on foot, but there are also pedicabs , horse-drawn carriages, and of course the F-Line streetcar , all of which will take you up and down the Wharf. There are also several companies in the district that rent bikes out to tourists by the hour or for the day, including Bay City Bike , Bike and Roll , and Blazing Saddles Bike Rentals . The California Welcome Center is located on the second level of PIER 39, and they offer visitor maps and information on Fisherman's Wharf which will help you navigate your way around. From Fisherman's Wharf, one has a wide variety of options to explore the city and the Bay by water. The following companies provide cruises or ferry service from Fisherman's Wharf. The National Park Service has an arrangement where a single company is granted an exclusive franchise to travel to Alcatraz. If you want to go to Alcatraz, there is only one company you can travel with, and private boats are forbidden. Recently the franchise was won by the non-union Hornblower Cruises company. The previous company, Blue and Gold Fleet, was a union shop. The union is currently picketing the Alcatraz Cruise to protest the loss of their jobs — only a small number of employees were hired by Hornblower. The union also claims the new cruise is unsafe and that the crews are inexperienced, despite the fact that the NPS and Coast Guard inspects for safety and Hornblower has been a cruise company for over twenty-five years. For the foreseeable future, you can only visit Alcatraz if you are willing to cross this picket line. Alcatraz is a decommissioned island federal penitentiary nestled beautifully in the bay. Before it was a prison it served first as a lighthouse (the West Coast's first lighthouse), then a military outpost, and then a military prison. After this, it served as a federal prison for 29 years between 1934 and 1963. Its location was near perfect due to its isolation and the frigid waters and hazardous currents of the bay, which made escape attempts difficult to say the least. Known by it's nickname "The Rock", this prison was once home to some of the most notorious inmates in U.S. history. 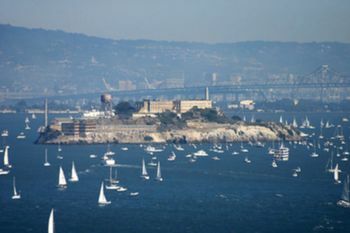 Famous inmates included Al Capone, who served four and a half years here, and Robert Stroud — "The Birdman of Alcatraz," — who spent a long 17 years here. The notorious gangster and bootlegger, George "Machine Gun" Kelly, also served time at the Rock. It was claimed (by the penitentiary) that no one ever escaped from the prison alive, despite 29 separate attempts. Take a tour and listen to an audio tape in English, Japanese, Chinese, or other languages. The most interesting aspect of the tour is that you can go into the prison and see what it was like to be imprisoned. The tour takes you all around the interior of the prison, including into some of the tiny cells, the segregated cells, the old barber shop and mess hall, and then out into the parade grounds and exercise yard. It might be more interesting if you've watched the movie Escape from Alcatraz and seen what happened in Alcatraz when it was operating as a prison. Tickets for the Ferry to Alcatraz are available at the Alcatraz Cruises website, but they sell out fast so buy in advance. Only one company is allowed exclusive access to dock at Alcatraz. There are five principal shopping centers in Fisherman's Wharf. However, all along the Wharf and its side streets you will find an abundance of souvenir stores, T-shirt stores ("I'm with stupid" and "Alcatraz Outpatient"), electronic stores (digital cameras etc), candy and sweet stores, jewelry stores, craft stores, and various other specialty stores of all descriptions. 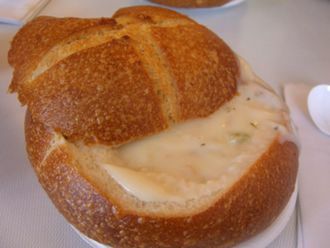 Three of the major shopping centers of Fisherman's Wharf are also attractions in their own right: Pier 39, The Cannery, and Ghirardelli Square, which are all listed under the See section above. Each one has multiple shops to explore. Many of the restaurants here are seafood restaurants, so if you're not into seafood at all, it's best to go to any other section of town. 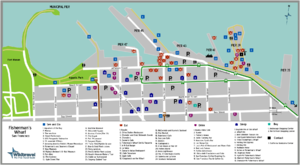 North Beach (Italian) and even Chinatown are within healthy walking distances. 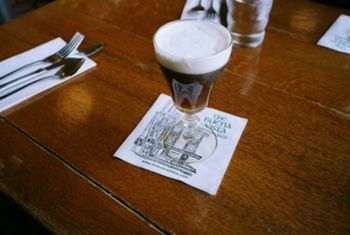 Many of the older established restaurants have Italian names like "Castagnola's" and "Alioto's" — a reflection on the fact that many of the Wharf's first fishermen were immigrant Italians. Alas, much of the fare available is overpriced, but not all, there are still plenty of places on the Wharf where you can fill up on the cheap. If you're tired of the manic crowds, get take out and bring it up to Aquatic Park where there is lots of room to sit and enjoy your food in peace. Many of the nation-wide chains have hotels in the area but the prices can be very high, so expect to pay a premium. There are very few budget options here, so if you're traveling on a shoestring and need somewhere for under $100, you'll have to either go south a bit towards North Beach, or west towards the Marina. Either way you'll just be a 10 minute or so walk from the action. If you are insistent on staying within the Wharf area, do check for the actual location if you want to be right in Fisherman's Wharf — the names of the accommodations can be confusing. Fisherman's Wharf sometimes attracts an unsavory element; with questionable charitable organizations, timeshare marketers, and 'Three Cup Shuffle' scam artists. It's wise to steer clear of these traps, and be mindful of how you spend your money. Beware of pickpocketing, it is a common occurrence at Fisherman's Wharf. Follow the usual steps for avoiding being pickpocketed, such as keeping your wallet inside your front pocket or an inside jacket pocket. While not necessarily a danger, the Wharf (being the major tourist destination it is) is home to a huge number of buskers, and some of them get pretty creative in order to coax you out of a few bucks. Particularly well-known is the infamous "Bushman," who sits behind a pair of eucalyptus branches and harmlessly scares passing pedestrians. It's always best to take such antics with a sense of humor — and hey, if you enjoy it, why not drop a few bucks and stick around to see the next unknowing person get scared/entertained? The Marina — If you are interested in boats in general, why not take a 15 minute walk over through Fort Mason and into the Marina District. There you will find some impressive yacht clubs with both sail and power boats. This page was last edited on 3 March 2019, at 11:51.